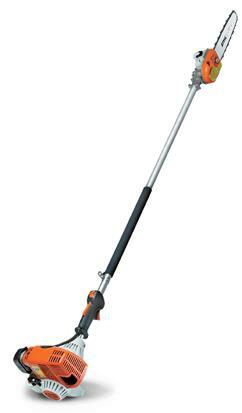 Pole pruner with 5' 7" shaft allowing the user to reach branches up to 10' above ground. * Please call us with any questions about our saw pole chain gas rentals in Tyler TX, Jacksonville TX, Longview, Marshall TX, Palestine TX, Nacogdoches TX, Mt. Pleasant TX, and East Texas.